A few months into 2016, several web design trends are emerging and look like they will have a significant influence on how websites are built this year. Churches might seem far removed from the latest advancements in the field of web design, but this year’s most cutting-edge church websites will likely incorporate at least a few of these trends. Even if your church isn’t looking to win a web design award, it can use some of these trends to create a website that will stand out in 2016. Web designers have been incorporating more and more graphics into sites for years now, but some pages aren’t natural fits for images. Because visuals continue to drive much of the Internet’s traffic, churches are searching for creative ways to incorporate pictures and videos into pages that have previously not had many graphics. As the use of video increases, there will likely be more churches creating their own YouTube and Vimeo channels. Some churches may keep their channels private, but many will make them publicly viewable for people in and out of the church. Although not directly tied to web design, the growth of videos in web design will probably be accompanied by a shift in services. The use of video in Sunday services will likely grow. For years now, many churches have posted songs and sermon notes on slides during their services, and showing videos isn’t a big step for congregations that already read music or verses off of a screen. At some churches, announcements, sermon introductions and testimonials may be shared in services via video and then uploaded to websites. Churches will continue to invest in web designs that provide a consistent user experience and church brand. Consistent branding isn’t new to church web design. Churches have been looking for templates that give their sites a uniform appearance for several years, at least. In 2016, the user experiences and church branding on websites will become more comprehensive. Churches now aren’t just looking for sites that have matching pages. They want additional features, such as online giving solutions, member directories and calendars, that seamlessly integrate with the theme and colors of their sites. Churches will consider more than their websites’ basic designs this year and invest in additional features that are customized to match the rest of a site. People spend a lot of their time online on social media platforms, but many churches haven’t made social media a priority in their online strategy. Too many people spend too much time on Facebook, Twitter and other platforms for churches to ignore them. Many churches will increase their efforts on social media this year. As they do, social icons and links will become more prominent on their websites. If you haven’t already, you’ll soon begin noticing icons that take you to church’s social media profiles on their websites, as well as more encouragement to share and like church news. Online giving is quickly becoming an accepted way to donate to churches small and large. Many companies now offer online giving solutions for churches, and more churches will adopt the practice in the coming year. Almost all churches will still take offerings during the service, but many will also provide ways for members to give virtually. Churches that aren’t yet accepting online donations aren’t the only ones that will be looking at website-based giving solutions this year. Congregations that have been using inexpensive solutions that aren’t built into their website will explore options that better integrate with their website’s user experience and branding. Online event registration has been an option for churches for years now, but websites will better be able to support it in the coming year. Many church websites already have easy-to-create forms and built-in calendars that make setting up and linking to an event registration page simple. As more churches adopt online giving solutions, they’ll also be able to collect registration fees for events that have them. Not all online giving solutions let churches set up one-time events, but a growing number do. 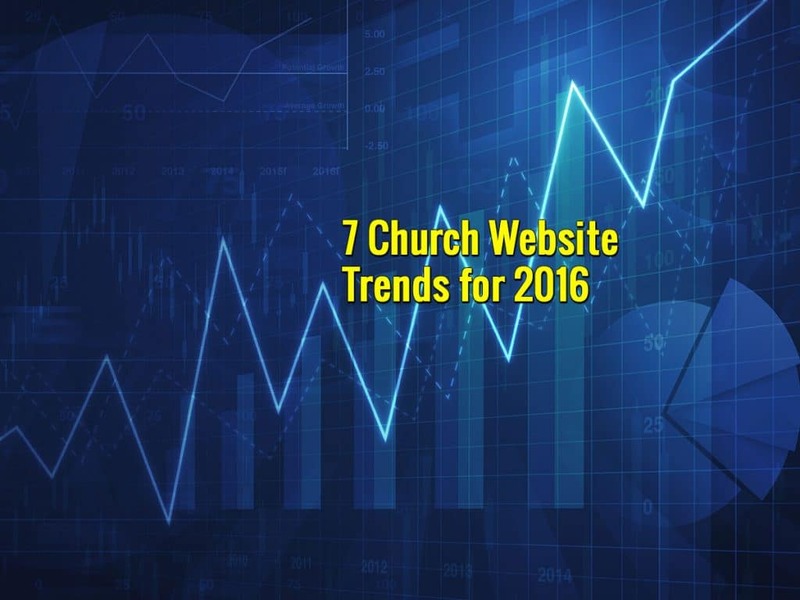 As you look at your church’s website, ask yourself if it’s following any of these trends. If the website hasn’t been updated in a while, perhaps this is the year to give the site an overhaul and incorporate some of these growing ideas into the design of your church’s website. They’ll give the site new life and make it stand out to anyone who sees it.